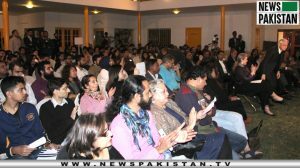 KARACHI: Alliance Française de Karachi (AFK) was the venue where karachiites converged to celebrate Pakistan’s first Night of Ideas (La Nuit des Idées) titled Facing the Present. Every year, on the last Thursday in January, cities around the world celebrate the Night of Ideas bringing together prominent French and international thinkers to debate the major challenges of our time. The event celebrates freedom of ideas, thinking, expression and knowledge by conferences, seminars, forums, and roundtables, screenings and artistic performances inspired by a common theme. The Citizens Archive of Pakistan and their Oral History Project team brought a unique story sharing experience connecting AFK to Peeru’s Café and NCA students in Lahore through an immersive audiovisual technology “portal”. Conversation was open to all, about the Night of Ideas between Karachi and Lahore followed by a live performance by Peeru’s Cafe artists. This friendly public debate (the main event of the night!) on the theme Facing the Present wondered: Who is better equipped to deal with the challenges of our time – intellectuals or artists? Bold and inspiring speakers from each “side” faced-off on this question in pithy 7-minute TED-style talks: How are our intellectuals and artists using their work to address the various challenges of our present and future? Each made the case for why their medium was so well-suited to facing our time. In the end, the audience voted on who has won the debate, and how both sides could join forces to work together in finding solutions that benefit everyone. Shorts compiled by the Oral History Project team at the Citizens Archive of Pakistan featured the stories of Pakistanis. Visitors earnestly watched 3D/anamorphic chalk artist and muralist Obaid ur Rehman make live graffiti interpreting the theme of the night. The Patio reverberated by a fusion of eastern and western music by Tarz (the band made up of Yousuf Kerai, Islamuddin Mir, Ashiq Ali Mir, and Shehroze Hussain on the tabla, violin, dholak & sitar.